Many traders turn to chart patterns because they offer information that can be used to take action. Skilled analysts can spot precise buy and sell points on charts and they can also determine where the risk level has become too large. Many traders use charts as one source of information. But, they rely on other information to confirm the outlook based on the chart. In the case on one stock, the chart and the news are in agreement that there is significant down side potential. According to Barron’s, Best Buy (NYSE: BBY) stock is down today, although its quarterly results have mollified at least one bear. The chart seems to show a down trend and that could explain why the analyst is bearish. Patcher “applauds” the company for its “many accomplishments,” including reaching is ambitious financial goals “year after year.” He also writes that Best Buy’s earnings “continue to impress,” as seen by Tuesday’s report. Raymond James’s Dan Wewer is outright bullish on the stock and reiterated a Strong Buy although he shaved $5 off his price target to $85. He highlights the company’s ability to grow market share via its omnichannel strategy, while also cutting back on underperforming stores. That combination has been a big driver for earnings before interest and taxes, and operating profit for square foot has risen 100% over the past four years, he notes. While he’s “encouraged” by the good results, the growth of its services segment is still in the early stages, which could weigh on profits, and comparisons are difficult next year, leaving him on the sidelines. These opinions are all consistent with the long term chart which shows a potential topping pattern that indicates the stock could drop more than $20. A price decline often results in higher than average options premiums. That means option buyers will be forced to pay higher than average prices for trades, But, sellers could benefit from the higher premiums. In this case, with a bearish outlook for the short term, a call option should be sold. The call should decline in value if the stock declines and sellers of calls benefit from this decline. 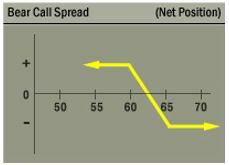 One strategy that traders can consider is the bear call spread. This is a trade that uses two calls with the same expiration date but different exercise prices. Traders buy one call and sell another call. The exercise price of the call you sell will be below the exercise price of the long call. The call is sold to limit the risk of the trade. So this strategy will always generate a credit when it is opened and will always have limited risk. The risk profile of this trading strategy is summarized in the diagram below which shows the limited risk and reward. While risks and rewards are limited, this strategy will allow traders to generate potential gains in a stock they might otherwise find too risky to trade. Many individuals ignore bearish strategies because of the risks. You’ll know the maximum potential gain with this strategy as soon as it’s opened. It is equal to the amount of premium received when the trade is opened. The maximum loss is equal to the difference between the exercise price of the options contracts less the premium received and is also known. For BBY, we could sell a December 21 $63 call for about $2.02 and buy a December 21 $65.50 call for about $1.13. This trade generates a credit of $0.89, which is the difference in the amount of premium for the call that is sold and the call. Remember that each contract covers 100 shares, opening this position results in immediate income of $89. The credit received when the trade is opened, $89 in this case, is also the maximum potential profit on the trade. The maximum risk on the trade in BBY is about $161. The risk can be found by subtracting the difference in the strike prices ($250 or $2.50 times 100 since each contract covers 100 shares) and then subtracting the premium received ($89). This trade offers a potential return of about 55% of the amount risked for a holding period that is about four weeks. This is a significant return on the amount of money at risk. This trade delivers the maximum gain if BBY is below $63 when the options expire, a likely event given the stock’s trend. Call spreads can be used to generate high returns on small amounts of capital several times a year, offering larger percentage gains for small investors willing to accept the risks of this strategy. Those risks, in dollar terms, are relatively small, about $161 for this trade in BBY.